The most simple formative assessment tool. I came across WEO at the beginning of this school year and was blown away at just how user friendly and simple this product is. At the time, I was using Google Forms and Flubaroo to auto-grade multiple choice assessments. This strategy did what I wanted and it even let me grade the short answer/essay questions by hand. However, the Google Form responses still needed to be exported to a Google Sheet (which, as a person who has never been on friendly terms with spreadsheets, has never really been my cup of tea) and graded by opening the Flubaroo add-on. WEO does all the things Google Forms does, and more. Let me list out the cool things that WEO does. 1. One-stop shop for formative assessments. When students join your class with the code you provide, they will have access to every formative assessment that you choose to share with them. You never have to share a link (unless you want to share a link to the log-in screen); simply tell your kids to go to weo.io and they're there. 2. Activities are super easy to create. Once you see how easy it is to create formative assessments on WEO, you will be shocked that someone didn't come up with this idea sooner. 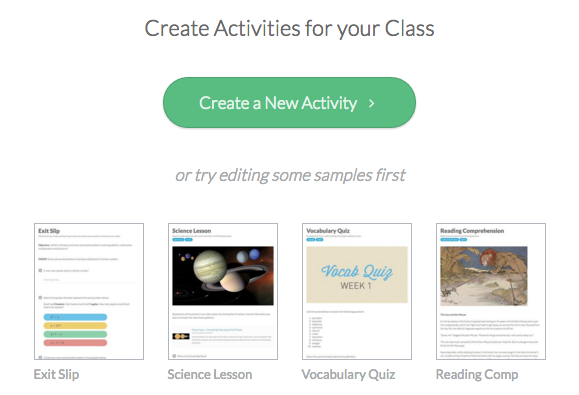 You can choose from some pre-made assessments (just add your own content) or start from scratch by "Creating a New Activity." Honestly, either way its really easy. 3. The question and content options are awesome and easy to use. When creating a new formative assessment or activity you can select from the options to the right. Add a question (choose from multiple choice, short answer, free response, and poll), videos, links, images, documents, and text to your activity. WEO calls them activities because they do not necessarily need to be assessed. It can simply be a learning module designed to meet the needs of your mastery objective. Options are simple and easy to use. 4. The data analysis is out of this world! WEO does the data analysis for you! As you can see, WEO has organized my students performance into bar graphs in the colored bar graphs on top. If I were to hover over those bar graphs, I would see which students fell into each range by name. I can also see the average raw score and percent in the top right. The bottom data show the average score for EACH QUESTION so you can tell in real-time which concepts need more work and if need be, break up the class into groups based on their performance on the activity. See which students were successful and which questions were the most unsuccessful. 5. Super easy to share common formative assessments with your co-workers. WEO is a lot like Pinterest in that you can follow other educators on the site who have the same content. This means that when they create a new activity, you have access to it. 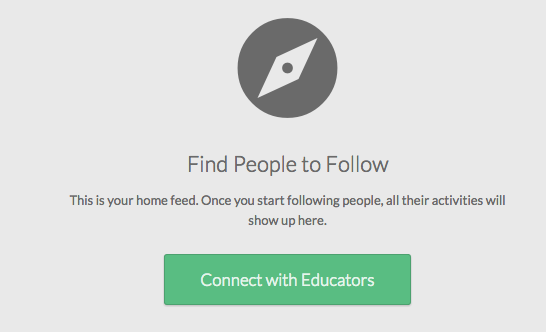 If your grade level cohorts "follow" you, they will see all the activities you create and vice versa. This makes WEO a great collaborative planning tool. Follow people just like other social media sites.